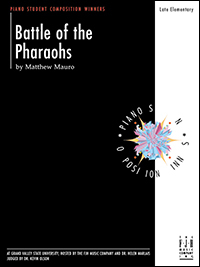 Marching briskly in cut time, this raucous, energetic piece has an ancient Egyptian sound and theme. Both hands play in bass clef, adding power and mystery. Hear the battle scene as left hand echoes right, deeper and darker. Easy to execute, and exciting to play! 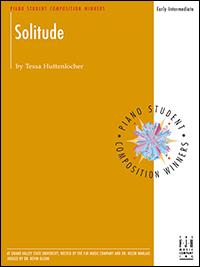 This beautifully sustained melodic waltz is written in a classical, homophonic style. Opening in a pure, d minor tonality, the left-hand broken chords often move in stepwise motion, giving First Frost a fresh, pentatonic sound. A great choice for working on legato touch and dynamic shading. This bouncy piece never seems to rest, even when the melody lands on C (five repeated C's round out the theme). Cross-hand octave jumps track the playful kangaroo, while chromatic motion up and down keeps the listener guessing what he will do next. Wonderful imagery! The opening of this piece speedily tick-tocks along (in toccata style) with mysterious accidentals. Then stop! It's time for a left-hand solo, playing the famous tune of the "Big Ben" chimes. Listen, and see if the clock strikes twelve (or more). This expressive piece features easy syncopations that give the melody a pensive mood. Arpeggiated chords in the left hand spanning 10th intervals paint the broad, flowing river. Scales, thirds and chords add a richer texture, as the piece develops and arrives. 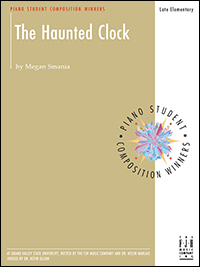 Teachers may wish to use this one as preparation for Romantic piano literature! Looking for an accessible jazzy piece with a sound that "grooves"? Look no further. Movin' On takes closed-position syncopated chords (often simple triads), and adds a moving bass line to create some more advanced harmonies. Easy to follow, but sounds like improvisation! Makes a pleasant introduction to light Rock 'n' Roll for piano. This energetic piece opens with rumbling eighth notes and New Age harmonies, which ask the listener to be ready for adventure. Cosmic Seasons then runs through periodic meter changes, accelerando passages, and dynamic broad strokes that are both beautiful and (at times) bewildering. Let your imagination fly!